Thanks to attribution modeling, we are able to measure the contribution of many advertising channels. But how many companies really go beyond last click? Attribution consist of tracking the touch points (channels, actions, events) that bring to the conversion. 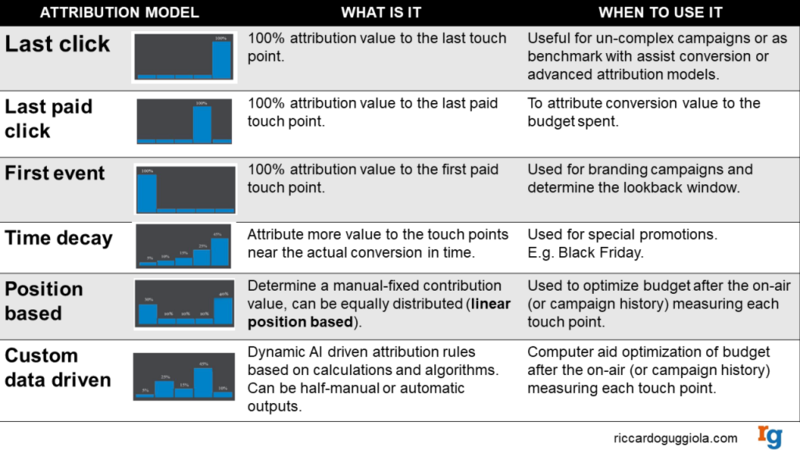 The attribution model is a set of rules to determine the value of each touch point. 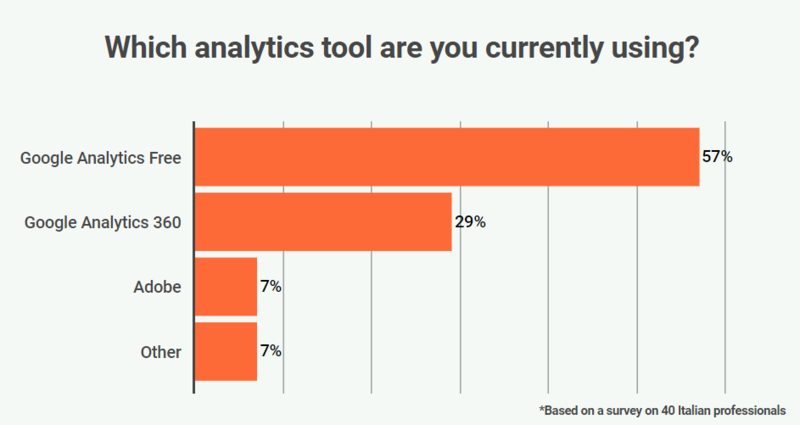 There are specific tools in the ad tech market that can be used by marketers, but the the most common and used (at least from the marketers I know) is Google Analytics Free Version. With this tool you can track basic online touch points, with all limitations of the free software. However the leader in web analytics gives really helpful insights if you are performing marketing/communication activities for small/medium companies. I also have to say that companies spending triple digits on advertising still use the free version of GA. I surprisingly found it out when I conducted a survey to marketers (also big spenders) asking them which attribution tool they were using. The 57% of them use GA free, while other companies go “pro” using tools such as Google 360 (29%), Adobe (7%). Other 7% of the companies decided to go with other attribution players, such as Commanders’ Act and Visual IQ. I also questioned them on how they use attribution models with specific interest on the last click model. Last click is traditionally the most used one. It consist of giving the 100% value to the last touch point before the conversion. Last click usage changed over time, before we go in further detail and see the series of attribution models, we need to contextualize it. Last click is not dead and it will not cease to exist, however it does not give enough insights if you are considering a multiple channel campaign. For example, when doing a Facebook campaign-only, the last click can be used since it is the only budget you are spending, and the Facebook attribution tool is enough for the analysis. But when you start adding complexity,the last click model can be used differently. In the table below, you can find a summary of standard and personalized attribution models. As said, last click is the most used model, but usage changed over time. Attributing the 100% value to the last touch point before the conversion of the user can be useful when you manage low budget or low-complexity campaigns. If you are running a budget only on Facebook, you can focus on A/B testing rather than knowing how to allocate budget on different media channels. But let’s say now you’re running a campaign on five different sources: Facebook, Google AdWords, programmatic display, native networks and a retargeting campaign. In this extent, last click is not efficient if analyzed by itself. In fact, when optimizing the budget allocation on the different sources, you may realize conversions are coming from Google AdWords when measuring the last click, but you would do a mistake to shift all budget there. You may indeed discover, thanks to the attribution measurement tools, that most of the users are converting on AdWords but first being exposed on a programmatic display campaign. This is what we call “assist conversion” which is the ratio between the mid touch point related to the last click. Assist conversions are the first step to take to go beyond last click, but as you see, last click is still essential for the analysis. Sometimes it happens that your attribution tool may show that most of the conversions are coming from “direct”, which has no budget involved, because the user may go directly to the website and purchase the product/service. In this case, if considering last click, we may do a mistake in the allocation of the budget. To avoid an incorrect planning, you can choose to give the 100% attribution value to the last paid event, in order to see how our budget have performed in relation to the conversion. Take last click and turn it upside down. This model gives the 100% conversion value to the first touch point. It is used especially when measuring TV campaigns or branding campaigns, to see what is the impact of an advertisement. Marketers also use this model to calculate the average lookback window, that is, how long it takes a user to convert. As the time goes by, each touch point decrease in value. Most of the value is given to the latest touch point registered before the conversion. This model is used for short-timing campaigns or campaigns that create scarcity. For example the special discount for Black Friday. This model is a non-standard one. The value of each touch point can be manually changed. I’ve seen up to 145 touch points before conversion, so be careful in using this model if you don’t know the ABC of attribution. Position based model is really helpful when you have already a campaign history or want to optimize the attribution model during a campaign. By taking the example of the 5 sources we did in the last click section, we can give a 30% value to the programmatic advertising even though the conversions generated on the last click have an attribution value of less than 2%. When you decide to allocate the even value between all touch points, we can talk of a linear position model. Custom data driven is a computer aid attribution modeling. The machine learning algorithms can be very helpful in analyzing data and give suggestions on the best attribution model. Please note that the model can integrate more audience information. For example, you can decide to set specific attribution models based on specific segments, and thus adjust the budget allocation by adapting a different buying strategy. Always improve your campaigns: remember that campaigns are affected by seasonality and other external factors. Don’t leave the last click, use it wisely in accordance with the complexity of your campaigns!